Greeks & Christmas Traditions: Christmas is the most celebrated holiday of the year, especially for Greeks! It goes without saying, that people hold traditions coming from many many years ago. Kalanta, Melomakarona, Kourampiedes, Mageiritsa, Souflimas, Agios Vassilis, Tsourekia, Christopsomo, Kalikatzaroi, Christmas presents, Christmas dinners and more, create a festive atmosphere lasting for almost 12 days! Embracing new Traditions: What makes Christmas so special is that, along with all the customs and traditions coming from the olden days, people love creating and embracing new ones. 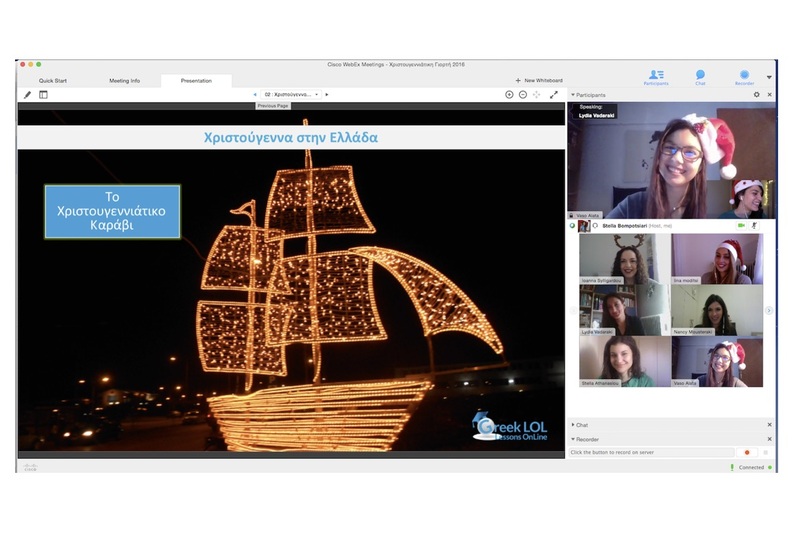 In December 2014, the team of Greek Lessons OnLine introduced the world to the OnLine Christmas Celebration! OnLine Christmas Celebration: Every year, a few days before Christmas, we “open the doors” of Greek Lessons OnLine event centre, welcoming our students and parents from all corners of the world! Our students present their assigned Christmas projects and we all play festive games, sing, exchange wishes and celebrate this very special and unique occasion of being members of the first and unique OnLine Christmas Party! Christmas OnLine Celebration 2017: This year our teachers have taken a step back to let our students become the hosts of the celebration. Our students will present some very unique greek Christmas customs and share with us their favorite Christmas holidays. Then we will all play singing games and in the end we will show a special video animation project, inspired by the fairy tale “Απόδραση από το Ζαχαροπλαστείο» and designed and performed by our students and teachers! Introducing Christmas OnLine Celebration makes Christmas even more special to us. “Knock on our Door” to join us and make this tradition part of your Christmas holidays too! Merry Christmas to all of you from Greek LOL Lessons OnLine! (Opinion) Christchurch Massacre: How Devastated Are We Really? (Opinion) Why Can’t I Criticize My Religion?